Burlington City Hall is located at 525 High Street, Burlington NJ 08016; phone: 609-386-0200. Photo: Isaac Collins House, ca. 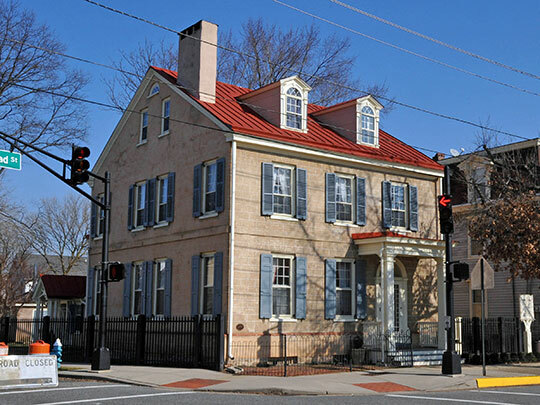 1785, 201 Broad Street, Burlington, NJ. Listed on the National Register of Historic Places in 1992. Photographed by User:Jerrye & Roy Klotz MD (own work), 2013, [cc-by-3.0 (creativecommons.org/licenses/by/3.0)], via Wikimedia Commons, accessed September, 2013. The old town of that name [Burlington] was settled by people from two districts in England, viz. London and Yorkshire. Very naturally, those who had been neighbors in their native country, desired to continue that pleasant relation in the new town which they immediately began to lay out on their arrival in the Jerseys in 1677. The settlers from London built together to the west of the main street, which ran directly up from the river, while those from Yorkshire took the land lying on the east of the division line. The memory of their choice is still preserved in the name of York Street. Burlington at this period was made almost an island – quite so at high water – by a small stream flowing through the low, marshy meadows back of the town, and connecting the Assicunk Creek with the Delaware River. The richness of the alluvial soil, together with the protection from Indian surprises afforded by this comparative isolation, probably weighed with the colonists in their choice of a home. Each party built a bridge over the stream in its section of the new town, and these for many years were known respectively as "London" and "York" bridges. The latter was situated in what is now the extension of Federal Street. There is no authentic record of its construction or appearance. Over it passed the road to Amboy and New York, and it remained in service until about 1800, when it was superseded by a solid causeway. London bridge was a substantial piece of stone masonry, with a wide arch, on the main road to Salem and the southern settlements. The year of its construction is not known but it was standing in 1700, and was probably built between 1680 and 1690. There is no tradition of any previous structure on the site.